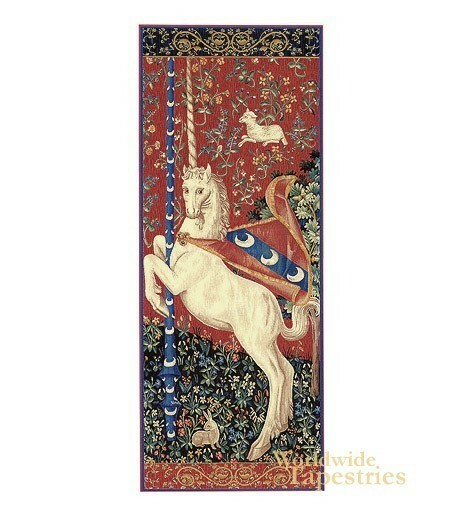 A close-up of the unicorn used in “Le Gout”, one of the six tapestries collectively known as “Dame a la Licorne” or “The Lady with the Unicorn”, “Portiere Unircorn” focuses on the lovely unicorn depicted in this classic work. The unicorn was a central part of many medieval works of art. It often represented purity, an allegory for Christ and the virtues he taught his followers. The larger works were commissioned by Jean Le Viste and were woven in 1511. The Mille Fleur background was very popular with the mills of Flanders, the center of fine weaving in the 16th century. The crest of the Le Viste family is clearly visible in the cape the unicorn wears. The three crescents against a blue diagonal line over red can be seen throughout all the works. “Portiere Unicorn” is a stunningly beautiful piece. This tapestry is lined and has a tunnel for easy hanging. Dimensions: W 29" x H 75"